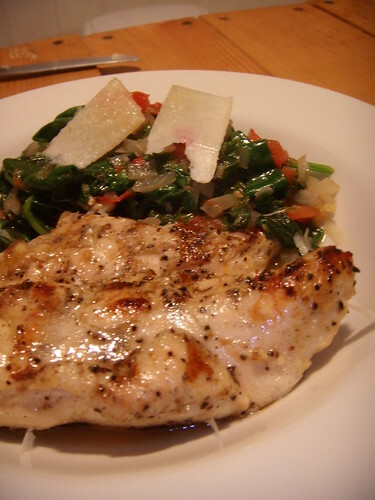 chicken and sauteed spinach, originally uploaded by aarn! +3rd July, 2008+. sauteed some finely chopped vidalia onions in sherry, added garlic, tomatoes, thyme, lemon juice and zest, and basil, and then steamed some fresh spinach on top. served with a few grilled tenders of chicken, and a couple shavings of romano.